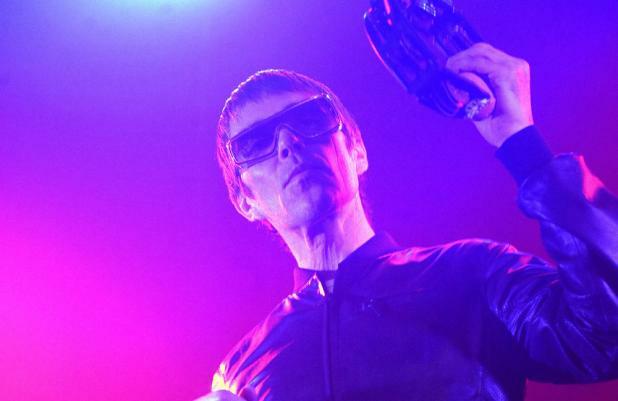 The Stone Roses played a triumphant reunion gig in their hometown of Manchester last night (29.06.12). The reformed band performed to a 75,000-strong crowd on the first night of their Manchester Heaton Park weekender, in what was their first major UK show together in 16 years. The group - made up of Ian Brown, John Squire, Mani and Reni - kicked proceedings off with their 1989 classic 'I Wanna Be Adored' and followed it up with 'Mersey Paradise', 'Sugar Spun Sister' and 'Where Angels Play'. Brown then quipped to the audience: "As you can see, we've still got it." Before playing 'This Is The One', a proud Brown asked the crowd in North West England: "Who's from Manchester?" As they cheered, he then told them: "Looking out, I can see we still got the best looking girls!" Before performing 'Elizabeth My Dear', Brown took a pop at the British royal family and the recent events to celebrate Queen Elizabeth's Diamond Jubilee. He said, "This song's dedicated to those parasites down the road... celebrating 60 years of tyranny!" They finished the set with a rendition of 'I Am The Resurrection', which was followed by a spectacular firework display. The group play again tonight (30.06.12) and tomorrow (01.07.12).